Today’s youths are immersed in a world that is technological, fast paced, and sometimes mean spirited. A so-called culture of violence is played out in video games and the media and echoed in the angry street slang that has become commonplace language. Music and videos advocate the use of drugs and alcohol and contain explicit lyrics that sometimes present and encourage suicide as a solution to problems. Some individuals suggest that a level of hostility exists today that was not as blatant in the world in which youths grew up even 10 years ago. Bullying, however, is not a new problem; its roots lie in the group behavior of our species that singles out a scapegoat to victimize and abuse. But the national consciousness has begun to recognize the devastating impact of bullying behavior on everyone involved—the bully, the victim, and the bystanders. Media reports have sparked grave concerns about the relationship between bullying and suicide, although research on the subject has been sparse. 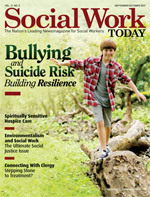 Yet in spite of the fact that coverage tends to overstate and neglect the reality that a large percentage of students who are bullied makes adaptive choices in response, it does identify bullying as one of the few risk factors for suicide that is intentional and external to an individual. So this media coverage also presents clear and unique opportunities for prevention. Thomas was in fifth grade when his parents first suspected something was wrong. During his earliest years in elementary school, he had been a reasonably popular kid, was invited to his classmates’ birthday parties, and stayed busy with community activities such as recreational sports teams. As Thomas entered fifth grade, however, his social invitations began to drop off. Instead of a pickup basketball game in the neighborhood after school, he would go home and play computer games. He started to gain weight because he exercised less and began to sneak cookies and candy into his room for snacks. His once-agreeable mood began to sour, but his parents simply chalked it up to the beginning of puberty. One day shortly after Thomas arrived home from school, his father asked Thomas to go out and check the mail. Remembering he had something else to tell his son, he followed Thomas out the front door and was startled to see neighborhood kids walking down the street throwing stones at his son. Thomas’ father interrupted the kids, who scattered in different directions. When Thomas came back into the house, he admitted to his father that he had been bullied for several months. “They call me ‘Dough Boy’ because I’m fat and white,” he cried. When asked why he had not told anyone about the bullying, Thomas said he was afraid it would just get worse. He admitted to his father that some days it was so bad he didn’t want to go to school and he had thought about running away or even killing himself. “Then it would be over,” he said. While the word “bullying” seems to have become commonplace in American vocabulary today, it’s important to define it in a more specific, research-based context. Dan Olweus, PhD, a pioneer in bullying prevention, defines bullying as behavior that is intended to cause harm or distress, occurs repeatedly over time, and occurs in a context in which there is an imbalance of power (1993). For example, in Thomas’ story, we can see the power imbalance in the number of neighborhood kids who have ganged up against him, the intentionality of their name calling, and the fact that these behaviors have been going on for at least several months. Bullying is present in many diverse behaviors, but despite its different media, the overall definition and impact remain the same. Bullying can be physical or verbal, direct (face to face) or indirect (social isolation or intentional exclusion). Cyberbullying, a relatively new form of indirect bullying, involves the use of technological devices such as cell phones and the Internet to target people. An especially insidious aspect of cyberbullying is that victims can be bullied 24/7 by faceless, nameless tormenters who cannot see the pain they are inflicting. Some studies (eg, Wang, Iannotti, & Nansel, 2009) have tried to break down the prevalence rates of specific types of bullying. According to Wang et al, it appears that verbal bullying (53.6%) and social or relational bullying (51.4%) are most common. Physical bullying happens least often at about 20% of the time. In terms of cyberbullying, the statistics are even more sobering. In statistics offered by BullyingStatistics.org, more than 50% of youths have reported saying or being subjected to hurtful online comments. According to an i-SAFE America survey, during the 2003-2004 school year, 42% of youths reported they had been “bullied” while online, with one in four reporting that it had happened more than once. Thirty-five percent of youths had been threatened online, with one in five reporting that this happened more than once. Research and experience have shown that bullied children and teens can suffer from significant mental health problems. Bullying victims have been shown to display higher levels of social isolation, depression, and anxiety, especially among girls and bully-victims (those who are bullied and, in turn, bully others). Bullying may also negatively impact youths who are neither bullied nor bully others. Bullying usually occurs in the presence of other peers, and many students either watch or instigate the aggression without reporting the situation to an adult or intervening to help the target child. These children are called bully bystanders. According to research cited by Orpinas and Horne (2006), bystanders who witness a bullying incident may feel helpless or even guilty for not doing anything to stop it, thus increasing their risk of mental health problems. There is mounting evidence of increased self-harm behaviors (such as cutting), suicidal ideation, and prior suicide attempts among victims of bullying. According to a 2011 study by the Centers for Disease Control and Prevention (CDC), among middle school students, bully-victims were 6.6 times more likely to report seriously considering suicide compared with youths who were neither bullied nor victims. Odds were lower for bullies (4.1 times) and victims (three times) but still significantly higher than youths who did not bully or were not victims. Rates were similar among high school students, though victims in this age group fared worse than bullies. The small number of research studies to date that have examined the links between bullying and suicide have shown that the teens who complete suicide after being bullied had other serious suicide risk factors. These included mental health or substance abuse problems, a family history of suicide, or a previous suicide attempt. This is why it is so important to be alert to preexisting suicide risk factors when dealing with a youth who may be a victim of bullying. These vulnerabilities may be compounded by the bullying incident, which can be the final straw or trigger an event that pushes an already at-risk youth to attempt suicide (Underwood, Springer, & Scott, 2011). Another important concern is media coverage of suicide deaths related to bullying that often exaggerates the connection between suicide and being bullied. By calling attention to the suicides of bullied teens and young adults and implying a direct causal relationship, the reality that most youths who are bullied choose healthier solutions for dealing with being victimized is largely ignored. In the minds of vulnerable youths, suicide may become the only solution. Breaking the adolescent code of silence is another challenge in the bullying prevention equation. In a perfect world, the culture would support and encourage self-reporting and peer reporting of bullying. Unfortunately, as shown in one study, only about one-third of victims notified a teacher or another adult about bullying (Wang et al). And while the number of bullying prevention initiatives in schools is increasing, many schools still have no formalized way to respond to bullied students. • The adult is warm, encouraging, and supportive. • The adult is clear that he or she is open to a conversation about bullying and can listen to the youth’s concerns. • The youth can be assured that his or her anonymity will be respected and that the report of bullying will be held in confidence. • The adult can ensure, and the youth can believe, that reporting the bullying will actually improve the situation and not just make it worse (Underwood et al). • Bullying does not necessarily lead to suicide, but it may make youths who are already vulnerable more susceptible to suicide. Educate yourself about the risk factors for suicide. • Since greater parental involvement is associated with less involvement in all forms of bullying, encourage parents to remain active in the lives of their adolescents, especially in Web-based activities where cyberbullying can occur. • Remember that bullying prevention can be accomplished by strengthening the resiliency skills of children and adolescents. Encourage youths to tell a trusted adult about bullying and keep telling until the adult takes action. If youths are being cyberbullied, remind them not to open or read messages from the person who is cyberbullying them but to keep the messages—they may be needed if official action must be taken. Block people who are bullying them through chat or instant messaging and, if they are threatened with harm, inform the local police. Finally, take advantage of the opportunities for prevention and building resiliency that can occur whenever there is a bullying incident that captures media attention. — Maureen M. Underwood, LCSW, is clinical director of the Society for the Prevention of Teen Suicide and coauthor of Hazelden’s Lifelines suicide prevention, intervention, and postvention programs. — Michelle Rish-Scott, PhD, MSW, is an assistant professor in the School of Social Work at Monmouth University and coauthor of Lifelines. — Judith Springer, PsyD, is a certified school psychologist and coauthor of Lifelines. Orpinas, P., & Horne, A. M. (2006). Bullying prevention: Creating a positive school climate and developing social competence. Washington, DC: American Psychological Association. Underwood, M., Springer, J., & Scott, M. (2011). Lifelines intervention. Center City, MN: Hazelden Publishing.